Celebrate Thanksgiving in style with ART Rotana’s Friday Brunch at the Rosso Italian Restaurant, featuring an extravagant banquet of thanksgiving specials, along with a vast array of superb live cooking stations fit for the occasion. Enjoy the unlimited premium wines and drinks while the exceptional Jazz band plays their best tunes for only BD20++ with non-alcoholic beverages and BD26++ with alcoholic package. The little ones will have the time of their lives with amusing planned activities. Enjoy authentic Japanese delicacies with the Infinite Sushi Night. Feast on all your family favourites such as Volcano Maki, Lobster Maki, Crispy California Maki, Rainbow Rolls, Yellow Fin Tuna Sashimi, Salmon Nigiri and more every Tuesday from 6pm to 10pm for just BD15++ or BD22++ including Unlimited Drinks. Bite into limitless oven fresh pizzas on Unlimited Pizza Night! Choose from a variety of slices prepared on demand for just BD7++ every Wednesday from 6pm to 10pm. Free entry and welcome drinks for all ladies at WAIKIKI’s PIRATES POOL PARTY. Be on “yarr” best best pirate costume for this themed pool party while dancing to special performances by DJ SOUFFE with DJ Arson and DJ Smiley. BD10++ for gents with a free house beverage and BD25++ for a special package inclusive of unlimited beverages & live grills. Do not miss the unique opportunity to experience Chef Wolfgang’s legendary pop-up restaurant Spago, the biggest event at CUT by Wolfgang Puck this year. 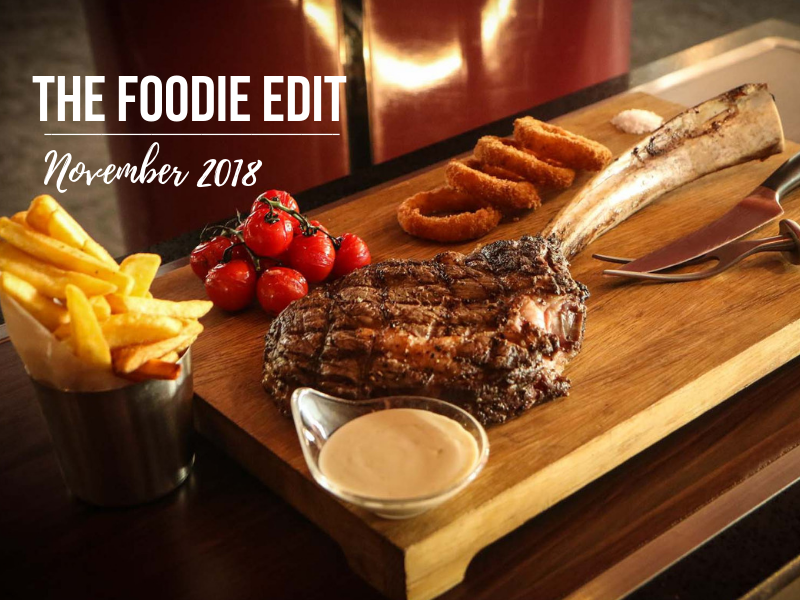 On the 8th and 9th of November, Dinner will have a choice of 6 or 9-course tasting menu with optional wine pairing for BD42++ and BD57++ respectively. On the 9th of November, Lunch will have a choice of 3 or 5-course menu for BD26++ and BD32++ respectively with an additional BD10++ for a beverage package. Don’t miss the opportunity this 20th until 24th of November to experience Michelin-starred Chef Bru’s modern and imaginative cuisine at the award winning Fusions restaurant! Indulge in amazing food and an unrivalled view of the Gulf Hotel Bahrain’s tropical gardens and Manama skyline. Take it slow every Monday with Legendz’ slow cooked BBQ ribs, glazed with their famous BBQ sauce for only BD7++. Pairs well with a glass of cold beer or your choice of a classic red wine. Enjoy a complementary bottle of house wine when purchasing two steaks from Legendz’ a la carte menu. For those craving for a festive buffet dining, Mövenpick Hotel Bahrain turned its Friday Brunch into an authentic Thanksgiving feast at the Al Murjan Ballroom on 23rd November from 12:30pm to 5pm. The Thanksgiving Brunch buffet features a great variety of festive dishes as well as international Cuisine and live cooking station, priced at BD36++, including unlimited selected beverages. Spice up your weekly brunch with a culinary journey around Mexico. Saturday Brunch Fiesta at Cantina Kahlo will hold authentic dishes, taco stations, irresistible sweets, and festive décor. Brunch is served every Saturday this November for BD20++ per person with soft beverages and BD35++ per person with select beverages. Cantina Kahlo will celebrate Mexican Independence Day on the 15th of September with a lively atmosphere and expanded brunch options. East meets west with live Carvery & Sushi every Friday in the award winning Links Restaurant. Get unlimited Carvery & Sushi from noon to 4pm for only BD14++ per person with live entertainment. Join the critically acclaimed Indian restaurant, Rivaaj, at Sofitel Bahrain, for a week of festivities, as they celebrate one of the most popular festivals of Hinduism, Diwali! Enjoy this festival of lights with authentic Indian gastronomic experience full of flavorful dishes and a special “Diwali Street Food Edition” featuring live cooking stations on the 8th and 9th of November. The Diwali Festival Week will be from the 4th to 11th of November with lunch at 12:30pm to 3pm and dinner at 7pm to 11pm.